Preheat oven to 375 degrees. In a large (12 inch) ovenproof skillet, melt the butter and add 2 T. of Porcini or Leek Olive Oil. When hot, but not smoking, add the vegetables and cook…stirring often until the asparagus is just getting soft. While the vegetables are cooking, whisk the eggs and milk together till frothy. Add the eggs to the vegetables and shake the pan to mix all of the ingredients. Reduce heat to medium and cook for 10 minutes. Remove from stove top, and place in the oven on an upper middle rack. Cook 10 minutes more until set, and a toothpick placed in the middle comes out dry. 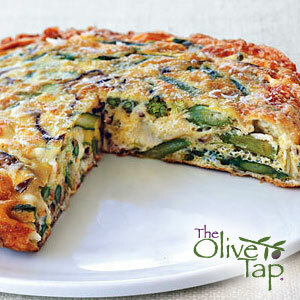 Switch oven to broil, and cook the frittata until the top starts to brown. Remove from the oven, drizzle remaining Olive Oil on top, and sprinkle with the Parmesan cheese. Serve warm or cold.